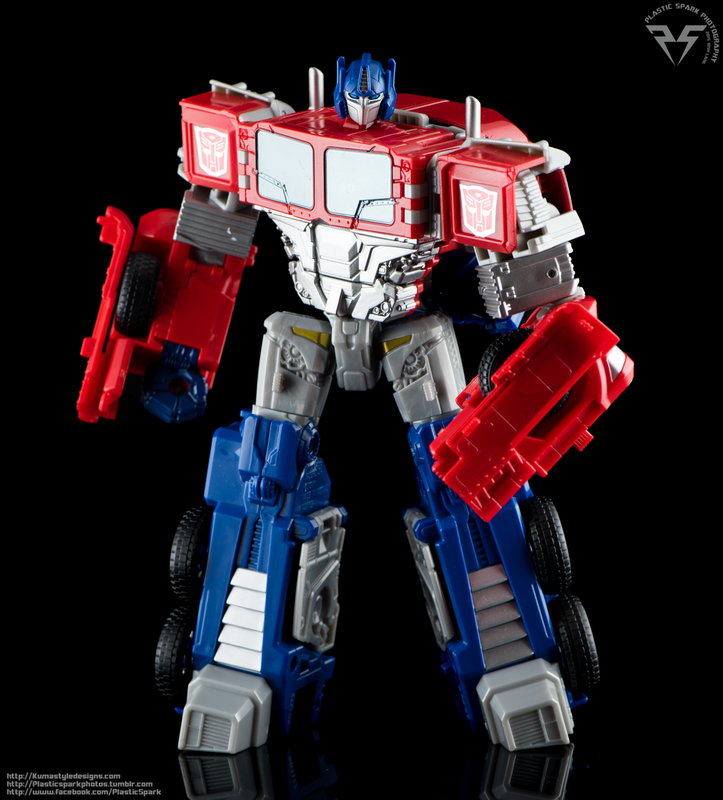 Most of Optimus Prime’s outer shell has its own unique tooling and design in comparison to Motormaster. The front grill, bumper, fenders and most of the cab is unique and he is missing the wind flaps on the top of the cab that Motormaster has. His front windows and grill are painted though he still suffers from a lack of paint on the side windows of the cab. Prior to photographing Optimus I applied silver to his rims using a silver paint sharpie. It was a simple process that took only a few minutes but the effects are incredible in making him look less of a cheap bargain toy and more of a finished product. With how little paint is already applied on him it’s ridiculous that the rims weren’t painted to begin with. I never noticed previously but the Stunticon deluxes all have painted rims compared to their Protectobot retools and the addition of a little silver to the rims really does wonders to the appearance of the vehicle mode. The rear end of Optimus Prime and Motormaster are the same just molded in different colors. One slight downside, is that next to CW Leader Ultra Magnus, Optimus Prime is massive and they really only look good together in bot mode. Optimus Prime’s robot mode betrays the fact that the mold was most definitely designed with Motormaster in mind over the Autobot leader. I don’t blame Hasbro for trying to milk an Optimus or two out of the mold but the wide, bulky proportions that were so fitting for Motormaster look incredibly out of place on Prime. His head sculpt is a short, round, football helmet that kind of looks like a squashed Optimus Prime, or maybe a bad Halloween costume from the 80s. It kind of reminds me of the art style of the G2 Transformers comics but still doesn’t quite hit that mark either. The proportions are all over the place with his tiny head, lanky arms and wide, flat torso making him a challenging, yet interesting subject to photograph. Finding the right angles to show him off can be tricky but he does have a few good sides. Much like Motormaster he looks a bit better in hand than in photos but Motormaster is in my opinion the far superior of the two. His hips have the same terrible ratchets in them that allow him to either stand with his knees touching, or spread so far it’s impossible for him to achieve a standing posture. Hasbro has since resolved this issue with the new Battle Core Optimus figure and the new Motormaster figures shipping with BC OP, but for now I have disassembled the thighs and merely flipped the ratchet piece upside down to allow for a much more versatile hip joint that relies on friction instead of the ratchet joint. This allows him to achieve the sculpted A stance his feet were designed for and he looks far more natural standing on a shelf. 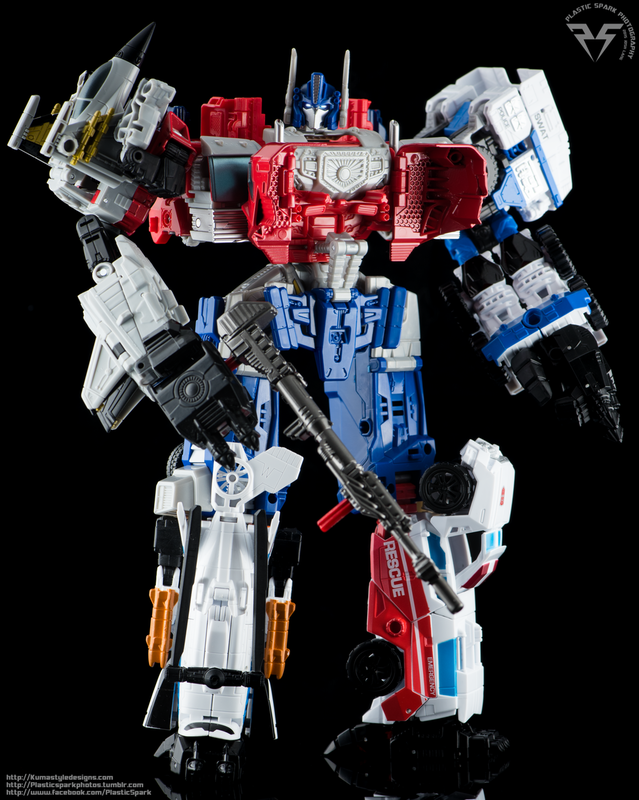 Optimus comes with 2 blasters. One designed to look like his traditional Ion Blaster, and another that looking a little more generic. Both weapons have an engine block style design to them, and when plugged in to the rear of the vehicle mode for storage form a sort of superfluous rear engine for Optimus. I will admit, for all his flaws as an Optimus Prime toy, I did find the combined mode to look pretty cool. The combiner head is a larger Optimus Prime styled head with large antennas and a battle mask. The robot mode arms fold up much tighter than on the Motormaster/Menasor version and there is no risk of them coming undone when manipulating the combined mode arms. He still suffers from the same lack of midsection that Menasor did though… not much to be done about that without upgrade kits. I chose to use Skydive, Rook, First Aid and Alpha Bravo for the combined mode to showcase them in alternate configurations (Arms as legs and legs as arms) and there is something about the final combined form that does look pretty cool if you can forgive his absentee abdomen and the fact that Optimus Prime is yet again hogging everyone else’s gimmicks. His Rifle can be combined just like Hotspot’s cannons into a long, gangly rifle, or they can be pegged in to his folded fists to form shoulder cannons for the combined mode. This is not a must have toy. Honestly I bought him on sale for $20 with the intention of purchasing one of the many upgrade kits coming out next year to make him into a leader class IDW prime. He’s fun, he’s a cool toy for kids or someone just needing to hit their yearly Optimus Prime quota but he’s not going to wow anyone. If you like the way he looks in pictures, or you want a combiner OP though he is pretty fun.